The American Eagle Palladium Bullion Coin Act of 2010 will soon become law. The Act passed in the House on September 29 and then in the Senate on November 30. It is now cleared for the White House. The Mercury dime's 'Winged Liberty' design by A.A. Weinman will be featured on the obverse of the American Eagle Palladium coin. When the Act, numbered H.R. 6166, is signed into law as the President is expected to do within a week, the United States Mint family of American Eagle products will expand to include palladium coins along with the gold, silver and platinum coins that have been produced for years. "I’m pleased that my legislation cleared the final hurdle and is now destined for the President’s desk," Congressman Denny Rehberg said Wednesday. "This is a good bill for Montana that will empower the private sector to create good, well-paying jobs. As the price of gold skyrockets, Palladium provides investors with an option for an alternative precious metal." Palladium is generally about half the price of gold but more expensive than silver. The London Fix PM price on Wednesday for an ounce of the metal was $716. The state Rehberg represents, Montana, is the only location in the United States where palladium is mined — at a site known as Stillwater Mine. "Stillwater Mining Company appreciates the initiative and sponsorship of Congressman Denny Rehberg in moving the recently passed Palladium Coin Bill through Congress," said Frank McAllister, Chairman & CEO, Stillwater Mining Company, "An official United States palladium coin will be highly valued by collectors and investors alike. We look forward to the minting of the new palladium coin by the U.S Treasury." The face value of the one-ounce .9995 fine Palladium Eagles will be $25, making it the second lowest denominated United States bullion coin after the .999 fine American Silver Eagle dollar (the one-ounce 22 karat American Gold Eagle is $50 and the one-ounce American Platinum Eagle is $100). The American Eagle Palladium Bullion Coin Act contains provisions for standard bullion investment-grade coins as well as numismatic Palladium Eagles struck in collector proof and uncirculated finishes. Surface treatments of the proof and uncirculated coins are to change each year. The proof Palladium Eagles must be minted at West Point, but the Treasury Secretary has the discretion to strike the uncirculated and bullion versions at any mint. 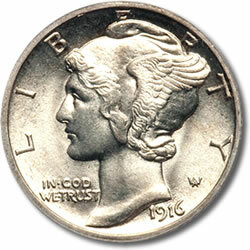 The obverse or heads side of each Palladium Eagle will feature the Adolph Alexander Weinman Winged Liberty design that was used on the Mercury dime between 1916-1945. However, unlike the old silver dime, the striking will be in high relief. The thickness and diameter of the coins are left to the Treasury Secretary and thus the United States Mint. The reverse or tails side of the coin will be a high relief of Weinman’s reverse design of the 1907 American Institute of Architects medal. Weinman may not be well known by name to the public, but his designs are. The current obverse of the American Silver Eagle coin, with more than 32.8 million already sold this year, features Weinman’s Walking Liberty design that was first used on half dollars between 1916-1947. The palladium coins must be minted beginning "not more than 1 year" after the Treasury Secretary submits a marketing study to Congress. As mandated by the American Eagle Palladium Bullion Coin Act, the market study will be an "analysis of the market for palladium bullion investments conducted by a reputable, independent third party that demonstrates that there would be adequate demand for palladium bullion coins produced by the United States Mint to ensure that such coins could be minted and issued at no net cost to taxpayers." American Eagle Palladium coins have been a topic of interest for many, especially with the recent proof gold and silver eagle discussions. Recent testimony in Congress inferred that if Palladium Eagles were struck, it would offer precious metal investors another option which might provide some relief in the demand for the gold and silver versions. Gee, I can’t wait for the mint to “discover” stones. What’s next, copper, aluminum and zinc coins? Thank you for exploring this beautiful and valuable metal. It is wonderful that the Palladium will be mined here in the USA. Stillwater Mining Company produced another beautiful Palladium coin in past years and their value has skyrocketed. A year ago I purchased 10 Palladium coins for $270.00 each and now they are worth over $900.00 each. PAlladium is making its mark in the jewelry industry as well. I cant wait to see this coin and definately cant wait to own as many as I can afford.